Could Someone Explain What Happened to Dr. Erskine? A couple of entries today. Sorry for the delay. People often say that Hollywood has run out of ideas. I would like to officially pinpoint the year that this monumentous feat occurred to July 17, 1996. How, you ask, is it possible to take such a broad opinion and set it to an exact day? Read on, my friend, and all shall be revealed. Now, it’s no secret that the movie industry has long mined other media for ideas. Be it plays, books, video games, radio, puppet shows, true life events, comic books, television or what have you, it’s all been tested and tried. In fact, it’s been tried since the dawn of the motion picture industry. 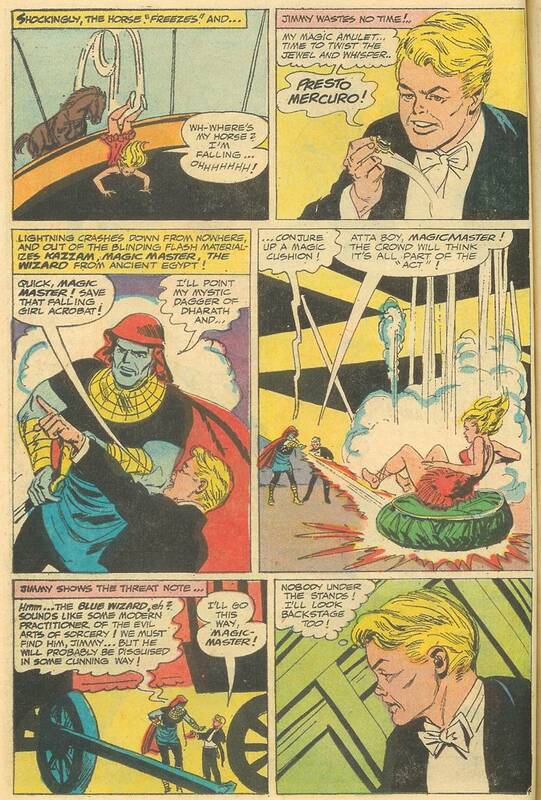 The depression/WWII era saw movies based on comic strips (Popeye and Blondie anyone? ), comic books (Superman serial, Captain America serial, the list goes on), radio (Lone Ranger and Green Hornet anyone?) just to name a few. The statement that Hollywood has run out of ideas stems from the fact that a lot of these selfsame ideas are being revisited, in many cases for the umpteenth time. But that’s okay. See, at least you can argue that these characters are popular enough to merit being reimaged now and again for a new generation. If done right new creative input can bring something fresh and interesting to a character that may have been stagnating over the years. This, my friend, requires some level of creativity. Why does the above image make a cold chill crawl down my spine??? 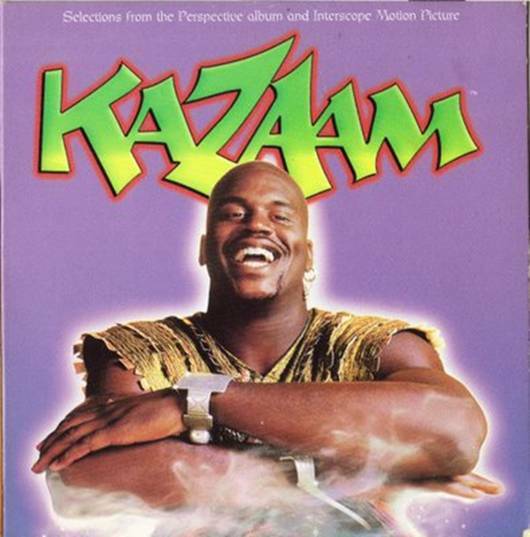 Yes, July 17th, 1996 – the day Kazaam was released upon the world. The movie featuring a young Shaquille O’Neal (Hall of Fame basketball player and very scary movie genie) as a “Rappin’-Genie-with-an-attitude”. You know, I could rant about this movie, but why? Just Google it and you’ll get your fill of rants soon enough. I mean the film’s got a 2.5 on IMDB for heaven’s sake! That’s like minus 100 on any other site. You know, if Shaq were painted blue I bet IMDB would give it a 3.0 at least – or maybe that wouldn’t have been PC? In a plot twist worthy of M. Night Shyamalan, Kazzam seems to reveal that the wizard they’re hunting is Kazaam! I mean, come on, how many Blue Wizards are there??? Okay, this really isn’t an image within an image from Marvel Super Stars Magazine #4, but it’s a brain teaser, whatever it is. I always enjoy reading the origins of characters, particularly well known characters when they’re thrust into another Universe. We had several versions of Superman and the rest of the DC Universe back in the multiverse years. We’ve had alternate timeline characters in just about every comics universe, and it’s always cool to see how small changes in the character’s life could alter their destiny. Lately I’ve been reading the Marvel Adventures line of books. It’s a universe very similar to the main Marvel universe, but with a more upbeat attitude and less graphic violence. Let’s face it, we all need a break from doom and gloom once in a while. 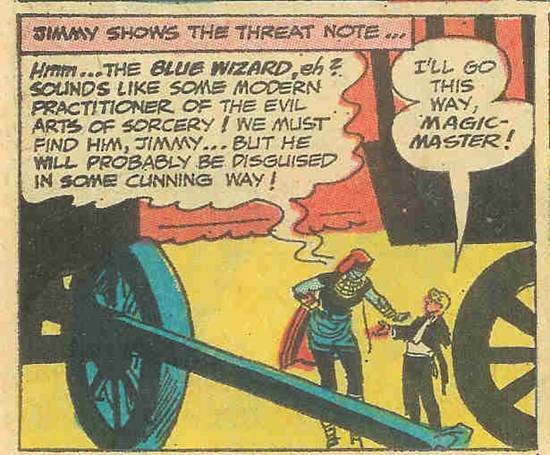 Things you notice reading Marvel Adventures – they change things that could negatively impact a child’s mind. 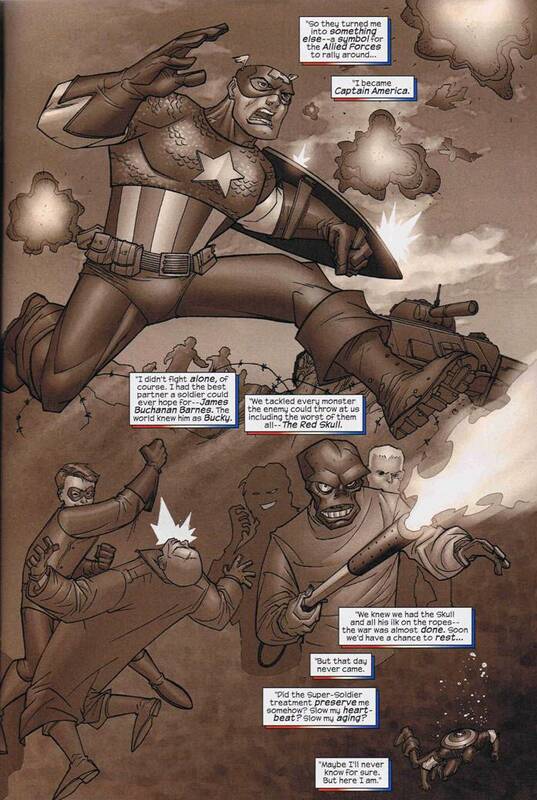 For instance, Cap was actually created by being inoculated with the super-soldier serum. Now, I’m guessing Marvel didn’t want kids to get the idea that shooting up drugs will make them like Captain America, so they revised the origin so now Cap gets electrocuted instead. Genius! “His secrets died went with him.” English was never my best subject, but what? 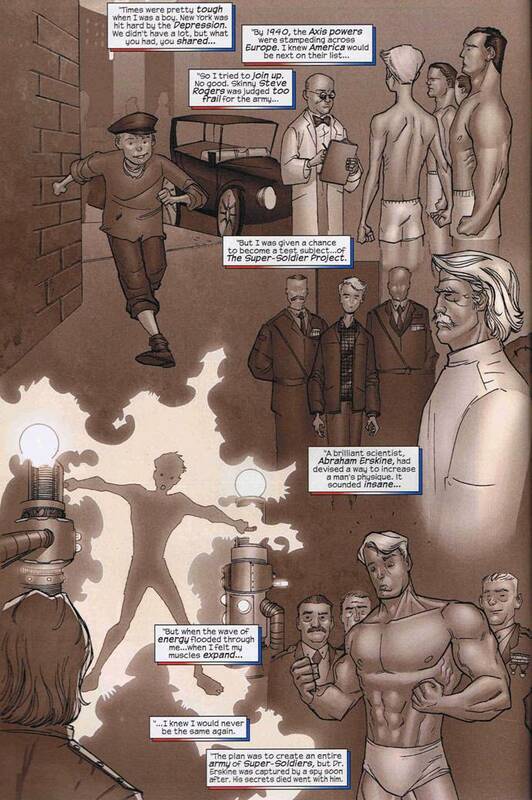 Now, I know folks don’t die all that often in the Marvel Adventures universe, that explains the whole “Dr. Erskine was captured by a spy soon after.” Then what happened? If the next line were “His secrets went with him,” then the question is why didn’t the Nazis create their own army of Super-Soldiers and overrun the Earth? The formula obviously worked and I’m sure they would have figured out some way of getting the info out of the good doctor, and they had their own scientists to make sure everything worked just fine. Okay, so maybe the line is “His secrets died with him.” Now, uhm, when did he die? If the spy wanted to kill the doctor, then he could have just done it. Why would the spy go to all the trouble of capturing Dr. Erskine only to then kill the doctor? Wouldn’t the spy want his country to be able to create Super-Soldiers too? Or maybe Dr. Erskine committed suicide? Not exactly a kid friendly plot-turn, that. I know in the original story Dr. Erskine is killed by a spy very shortly after he inoculated Cap with the Super-Soldier serum – he was never captured. And the spy was then killed by Cap. Not terribly non-violent, but a whole lot less confusing. And now I have a headache. Great. Say, if you’ve got a better theory on the whereabouts of Dr. Erskine, let me know.